I've been drawing at Michael's studio for about four years now. The models, lighting, stage, and facilities are superb and both Michael and the artists who attend are among the kindest –and funniest — people I've ever met. The stage includes ingenious and very sturdy ropes and other contraptions that adventurous models use to great effect. Michael consistently hires the most talented and capable models in the bay area, auditions new models regularly, and goes out of his way to support these people in their other (often creative) endeavors. He also provides timely notices whenever his students are showing their work. You will not find a more supportive environment anywhere — and as an added bonus, both Michael's music and his food (he serves fresh baked cakes and breads at the break) are just great. I have been drawing from the model for close to forty years now at a wide variety of venues, from art schools, both in California and New York, to my own drawing group. I have never had a studio so perfectly suited to working from the model as the one Michael Markowitz has created. The model is elevated on a dias so that everyone can see, and the walls around the model stand are covered with a dark fabric so that the contours of the figure are easy to read. There are plenty of props for the model to use so that the variety of poses possible is extraordinarily wide. Lighting is great, music is wonderful and the models are the best in the city. I cannot believe that I discovered this gem so late. I drew at the 23rd Street Studio twice a week for many years and was in one of the first groups that took advantage of the special opportunity that Michael offers to artists. He has run a highly professional studio and has provided a very valuable service to the community. The models are the best available anywhere, the atmosphere and ambiance of the studio are extremely conducive to an extended focus on the figure. He offers a wonderful setting at a very reasonable price with the highest quality models available . . . and, the music is the very best you'll ever hear. Michael's classes are well organized and well attended. His highly professional models are among the best in the area. It is always a pleasure to attend. The students range from brilliant artists to beginners, and everyone is made to feel welcome. I've been to a bunch of different figure drawing workshops and hands down the setup at the 23rd street studio is my favorite. The model stage is well thought out, the lighting is great and the models are all very professional and a joy to draw. The atmosphere is relaxed and welcoming, everyone is cheerful and friendly and the nightly treats are always delicious. If you're looking for a weekly spot to draw from a live model, there isn't a better place. Having lived in the mission for many years, I had no clue that this place was only a few blocks from my home. Though I draw daily for a living, my life drawing skills have gathered dust since graduating art school 5 years ago. After searching online, I found 23rd street studio and came in for a trial day. The studio is warm and the surroundings homey and intimate, you can tell that the place is lived in and cared for. The models have been stellar, mostly dancers with near perfect bodies who seem very professional about their jobs of being perfectly still in sometimes uncomfortable looking positions. The music played really sold me, Tom Waits, old blues, and things I had never heard but allowed for a real enjoyment of the time spent concentrating. For anyone looking for a comfortable, clean, enjoyable place to spend drawing I can vouch for 23rd street studios! The 23rd Street Studio provides an exceptional combination of accommodating space, extremely well chosen professional models, well-programmed background music (usually selected by the model from a magnificent library of CD's). The twenty minute break, about two hours into the three hour session, gives artists and model a chance to relax with a cup of tea and a pastry, and tell stories. That make everyone feel like part of a community. I have been going to the Studio for almost twenty years, which attests to how well it meets my expectations. The relaxed and productive atmosphere at the 23rd Street Studio brings out my best inner artist. Simply put, sessions here are fun! feeling among the artists, whether they be accomplished, growing, or seeking. After having drawn at half a dozen Bay Area venues, I have settled on the 23rd Street Studio. Michael Markowitz has customized a great space to make it ideal for figure drawing. The studio is well managed and never over crowded. Great care is taken to provide a variety of models, many of whom are the best currently working. The most outstanding characteristic of the studio is one often overlooked, lighting. The model stage has the variable, directed lighting necessary to model the figure accurately. In 1993, I was planning a trip to SF to visit a friend, and he said something to the effect of: "You're going to love it here! I'll take you to a place where you can draw the best models in the Bay Area while listening to outstanding music and have cake and tea (or lemonade) in the break." We got married, and we're still drawing at 23rd Street Studio! Sentimentality aside, it is a very special place. As a business, it is very professional, and as a place to draw, it is inspiring. Michael, a celebrated figurative artist and teacher, has created a magical space. The first word that comes to mind when I think of 23rd Street Studio is "respect"... Respect amongst the artists, for the models, from the models, for our need for space, for our need to share, and for art. I started drawing at 23rd Street Studio because as a professional abstract artist I haven't practiced any figurative work since college. The set-up is fantastic with options for all types, seated, standing and flat surface taking advantage of every inch of space. Models range through many body types and are all highly professional, some of them are dancers with exceptional posing skills and dynamic sensibilities. Michael's long standing tradition of a long break with tea time and homemade baked treats is a chance to meet your companions and relax with some banter. Highly recommended! After moving from New York City to San Francisco, I have searched for a long time to find a drawing studio as good as the Art Students League, with no luck—until I went to the 23rd Street Studio. Very professional, relaxed and fun atmosphere! The models are great and the gradation of pose times is perfect." I've created most of my best drawings in Michael's studio. I think it's the combination of MIchael finding wonderful models, and the smell of cakes being prepared for the class break. I originally took a class at Michaels 23rd Street studio many years ago to development my drawing skills. The classes were extremely helpful for me. Since then I have been going to various drawing sessions at the 23rd Street Studio. I have drawn at a lot of other venues in San Francisco and this is the best one by far. The best possible and most professional models. Terrific music while drawing. Excellent lighting. The atmosphere is friendly Those drawing here are a very congenial and many are very talented. Michael bakes pastry and serves tea and juice during the breaks. If you want to draw or take classes to draw you can not do better. Michaels beautiful drawings on the studio walls are an inspiration and he is a great teacher and caring person. The 23rd Street Studio has got to be the best place in the city to draw the figure. The lighting is fine, the studio setup amenable, and - most importantly -the models are always first-rate. I've attended Michael's groups for drawing and painting. The painting sessions have involved extended posses which is really nice. The models are always the best in town. The studio is compact but well laid out and everyone has plenty of space to do their thing. The model sits on an elevated platform so always a good view. Full facilities and tea and cake to share with your fellow artists at the break. What more could you want. "Michael's studio offers the perfect environment for life drawing: a great space; dramatic lighting; eclectic music; and above all, amazing, talented models. I love knowing that each week I am guaranteed expressive, inspirational subject matter for my artwork." I have enjoyed this studio very much and have made long trecks from Marin to attend whenever I can. It is by far the best atmosphere with the best models, especially if you are looking for longer poses, of all the bay area studios. Thanks, Michael! I have done figure drawing in classes at University, the Denver Free University, the Art Students League of Denver and several workshops and classes in the Mendocino area. However, while in San Francisco I very quickly found Michael and the 23rd St Studio. I have never worked in a more stimulating atmosphere. I loved Michaels work from the beginning. Watching him work and the others in the groups was very useful for me and created an atmosphere of professionalism that was very high. The models are the best anywhere I have been and again I must emphasize the atmosphere. It makes you want to do your best and gives you the tools with which to do that. The work I have done at the 23rd St Studio is the best I have done anywhere or at anytime. Patrick Keller: Board of directors Mendocino Art Center. 23rd Street Gallery has the most amazing atmosphere and models. It's quaint--we have a tea/sweet treat break in the middle of our 3 hours!--and it offers a very supportive environment. I have taken both the teaching course and the regular drawing studio sessions, both have been wonderful experiences. I cannot speak well enough of the models who have moved me to some of my best work, tears, and some of the most exquisite moments of beholding beauty, I have had. I am very blessed to have found this retreat and refuge. Michael, the instructor has always been very attentive, insightful, and giving. I highly recommend his course to anyone wanting to become more in tune with their creative potential, newly born or already well versed. p.s. the challenge of some of the innovative exercises is well worth the effort, though I hate to admit it at times=). Having drawn and modeled all over North America and Mexico over the last 15years, I can with all honesty say that the 23rd Street Studio has been by far my favorite experience. Michael creates a wonderful, comfortable and creative atmosphere with great music, tasty treats and extremely talented models. I have been drawing and modeling at this studio for 6 years now, mostly in the non-instructional groups, but having sat in on his instructed groups as well, I can testify to the uniqueness and power of Michael's teaching style. I would highly recommend this studio to artists as well as models, and I will continue to be a part of this community as long as I live in the bay area. I was in Michael's Tuesday night drawing class for many, many terms. I still "draw" from that experience actively in my painting. Spending so many hours looking intently at exquisite and skilled models under M's unique and deeply insightful tutelage prompted learning on a lot of levels that have as much to do with being "awake" as they do with the act of "drawing". I wouldn't trade my time in Michael's studio for the world. It was an adventure and a privilege! anyone who wants to challenge their preconceived notions about "good"
their experience of the world." Michael Markowitz is a master drawing teacher. In his studio, equipped with gorgeous music and exquisit models, he creates an atmosphere that compels me to see and draw better than I would anywhere else. His forte is to get me to think and uncover what is blocking my connection to myself and my creativity. I began his figure drawing class as an absolute beginner, expecting to learn the rules of form, composition and perspective. I learned all of this, but only indirectly. His exercises are never laborious or tedious, his exercises taught me to see from levels I did not know existed and, before I knew it, I was making beautiful and original drawings that were deeply connected to myself and the world I live in. I cannot recommend him and his figure drawing studio enough. For 7 years I was privileged to be a student at 23rd Street Drawing Studio (then I moved to New York). The lessons I learned and the experiences I gained while drawing with Michael Markowitz and our group of students continue to have a profound effect on my life. 23rd Street Drawing Studio is a vibrant space filled with Michael's enthusiastic guidance, students open to discovery, and amazing models that generously offer their time, energy and expression to participate in a collaborative creative process that is often transcendent and always evolving. Michael's instruction gave me a tangible context with which to engage and connect with the present moment, without judgement, allowing my individual creative energy to flow freely. Our classes gave us a place to share our insights and frustrations, our ideas and our thoughts in a friendly, warm environment (tea, cake and great music included!). One of the benefits I am most grateful to have gained from drawing with Michael is that I have a stronger sense of inner confidence and infinite faith in the creative process. Awareness of this faith allows me to proceed with a sense of curiosity and playfulness, and this brings me joy. I had not drawn since the 6th grade when I started taking the instructional class at the 23rd Street Studio. My drawing has certainly improved, but the real reason that I love this class is that it has made a huge impact on my life. Learning about what is inside of each of us--exploring one's personal esthetic-- has brought about changes in the way I see my world. I told Michael that I was taking the class to get more involved in art, but the result has been a more artful life. The methods are challenging (but not in the way you might expect), the instruction is dynamic and the models are outstanding. And to top it off the studio is charming. I can see why people stay with it for years. Michael is an extremely impassioned and articulate teacher. He is supportive of all his students and encourages them with patience and respect, regardless of their art background and experience. Prepare to be pummeled ( but in a nice way !) by all kinds of truths about art and what it really means to be creative. Also be prepared to do a lot of un- learning. If this class can be said to have a goal it would be to help each student discover and develop within themselves their own authentic gesture; that is, mark-making free of preconceived, overly- intellectualized ideas about what a good drawing is supposed to look like. It's a stimulating and challenging class with ample time allotted for discussion, providing students with an opportunity to express their concerns as well as share moments of enlightenment. The models are beautiful and inspiring and the studio provides all the necessities and amenities. "In Michael's studio I was allowed to discover my true vocation. It was though his guide -in his classes- that I regain faith in my potential as an artist. That was possible because the huge improvement that I observed under his guidance. Michael is a tough, but compassionate teacher. Also, it helped me a lot to have the best models of the Bay Area, too. "Michael's drawing class is unique in more than one aspect. The approach makes each student develop his or her creative potential, without forcing a standardized drill. Do not expect a formula for making master drawings, rather prepare for a sometimes frustrating journey in self discovery. Regardless of the skill level, even if you've taken art instruction before or have an art degree, this is not going to be an easy class and I bet that your notion of creative drawing process is going to be dramatically changed if you persist and keep an open mind. The studio is intimate, very comfortable and all the models are superb." The figure drawing class with Michael re-awakened my joy for drawing. More than anything else, it has given me an energy and love for connecting with the experience of drawing again. The entire atmosphere of the studio has been so lovely and inspiring. I have enjoyed myself immensely and I'm proud of the drawings that have been produced. Thank you Michael. I attended Michael Markowitz’s beginning course after several years of figure drawing and found it quite valuable. His instruction is like no other. Michael does not teach using traditional approaches. Instead, he focuses on mark making and provides an exploration of the creative process itself. In short, Michael teaches passion for drawing. Michael's drawing classes are like a zen retreat in my busy schedule, a philosopher's circle, and weekly child's play, all at once. His space is warm and inviting and full of little surprises, and his music collection and figure models are always top notch. Michael puts so much thought and effort into his teaching exercises, which are designed to put us more in touch with our bodies, instincts, and aesthetic sense. His classes have changed my life in a big way, from how I perceive the world and its details, to how to live more authentically and open to experience. You will leave Michael Markowitz's class with drawings you like. More importantly, you will come away with an approach to creative problem solving that can inform your work whether you're an artist, lawyer or firefighter. In stressing the subjective and experiential parts of drawing, Michael has tapped into an approach that I've not heard of being taught anyplace else, but seems in retrospect to have been right in front of your face all along. I draw on things I learned in this class all the time, often in ways that have little or nothing to do with artistic technique per se. Michael Markowitz turns teaching into an art form. He calls upon his students to be fully present with themselves, with the feel of charcoal in one's hand and on paper, and with the experience of seeing – truly seeing – the model fully. He uses drawing as a gateway to having a more engaged, and more nuanced and subtle experience of living from moment to moment. The classes appear to be about drawing, but they're really about deeper truths and meanings than what his students put on the page. 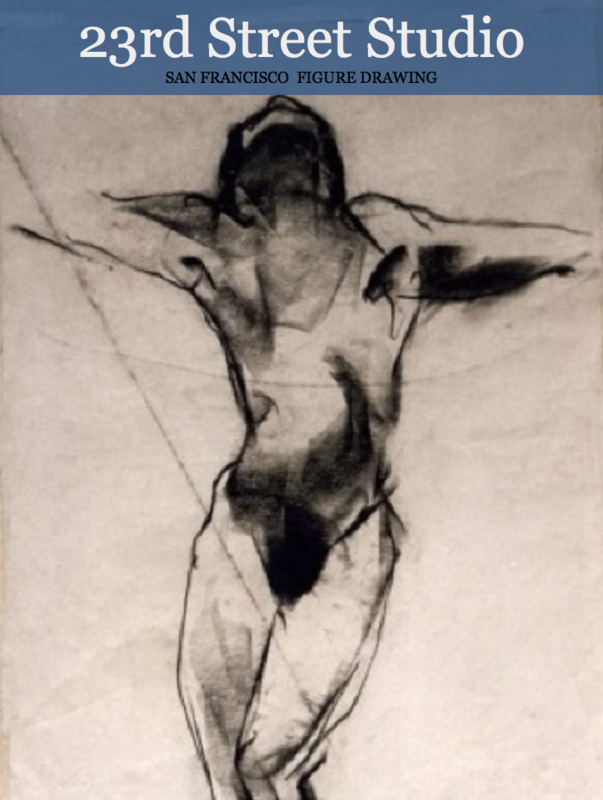 I entered Michael's session with no formal art instruction behind me, and little if any innate drawing skill, yet I had once been a life model, and had always wanted to be on the other side of the sketch pad, to feel the fluid complexity of drawing the human form. I loved his class; it was as much about perception, and spontaneity as recording---and one inevitably left it weekly, with a changed view of the world. I was hesitant to take Michael's class for years, but I screwed up my courage and plunged, as you should too. It is not about what you can reproduce, but how much you can feel. He'll show you, without judgment. Michael's classes are exciting, stimulating, and more like an adventure than what you might experience in a traditional academic drawing class You learn not only about the drawing process but some surprising things about yourself and your relation to others, There are times you truly come face to face with yourself. Michael is passionate about his work and teaching. "Michael's teaching urges you out of the need to create pretty lines and into direct energetic connection with the model, resulting in new pathways being formed between eye and hand, and dynamic drawing skills as a result. The models were the best I have ever had the pleasure to draw." I'd long admired the drawings of a particular Sausalito artist ( Barry Peterson). His work has a particular grace and brevity that imbues his drawings with energy that is immediate and alive. I was discussing his work with a mutual friend when she told me that Barry had studied for many years with Michael Markowitz at 23rd Street Studio. I signed up soon after and found that Michaels philosophy, communication skills and passion keep me alert to my own patterns and pushes for each mark to be a genuine expression in response to some of the most exciting models I have ever worked with. Ability level is unimportant in this method because the guiding principal is not of accurate reproduction but authentic visceral response. I'm happy to have found the 23rd Street Studio and can highly recommend it to others who want to develop a more intimate relationship with the artist within themselves. Michael, taking your workshop was an experience of a lifetime. You coached "the world does not need just another pretty picture", and introduced us to the concept of the "honest gesture". You prodded us to being authentic in our strokes, letting them flow boldly and effortlessly from within... a powerful metaphor on living authentically in our lives. Your work is a powerful combination of Zen and art. Vibrant drawings with an incredible quality of line, intense chiaroscuro and overall mastery of the medium are all quite evident outcomes of Michael’s teaching and yet they are just the tip of a much deeper and significant creative process. Initially, I was drawn to Michael’s studio by my own “artistic aspirations” and by a deep aesthetic appreciation of his art work. Now back to Michael’s studio, 10-year later and after a long personal journey to become psychotherapist, I find that the approach to figure drawing that Michael teaches is still one of the most powerful creative expression processes I have had the chance to experience. Michael is able to guide one into that creative area where no technique, rule or map will help. During the 22-week course there are many opportunities to witness one’s own resistance to let go of any preconceived ways of doing things as well as to see which are one’s own usual reactive patterns to external stimulus. With Michael’s help and with his acute ability to spot and reveal the different subtle tricks that the mind plays to stay in control, it is quite common, to experience a freeing of inner space while increasing one’s appreciation for the wonderful physical/sensual quality of this creative process. Class after class I slowly rediscover the pleasure of fully embracing one of the most essential quality of the creative process: a growing sense of trust and self-confidence in being able to respond to what the moment is offering with a level of awareness that bypasses the mind. For me the process taught by Michael is a very valid practice of active meditation. It allows me to sustain my presence in that space where every gesture gets its meaning and authenticity by the vibrations of connections that are present in the moment instead of being defined by common and already well defined terms of inner/outer boundaries. In many ways this process is so powerful that brings back our most primal connection to life, and the vitality of this rediscovered authenticity is reflected not only in our drawings. In 15 years of modeling on both coasts and abroad, Markowitz' studio has been the most nourishing, fun, inspiring studio I've worked at. When modeling for his teaching classes, I always get wisdom I can apply to the modeling itself, to the creative process across media, and to Life. Michael creates a space ~ through music, lighting, available props, and a sense of community ~ that brings out the best in models and artists alike. As a model, the 23rd St Studio is one of my favorite places to work for in the Bay Area. Michael created a warm, friendly, comfortable and respectful environment for his students and models, that inspires creative work and social interaction. Michael’s classes are engaging and fascinating, communicating very important points of engagement with one’s own creativity as well as with the world we live in. Mr. Markowitz's courses are a great opportunity to let go of pre- conceived ideas of what it means to depict the human figure and instead have a chance to explore deeper, complex and more expressive methods. As I sit on the model stand I love to listen to Michael’s instructions, they enlighten me and make the hours on the model stand exciting. The students, as well as the artists who draw in the non-instructional classes are a wonderful group of serious and friendly people that are a pleasure to work with. A gracious host and a unique and stimulating educator, Michael has created an environment that fosters creative engagement for artists and models alike. The artists are serious and focused during drawing sessions and playful and informative during breaks. I've always loved being a part of this community both as a model and as an artist. 23rd St. Studio: A great space, a stimulating community, a unique curriculum, a passionate instructor, inspiring models, a great selection of tunes. . . all that and a freshly baked snack! Beat that. I am an acting and modeling coach who also teaches watercolor painting. I also work as a live figure model at the 23rd St. studio. Although I have been with them less than one year, it is a warm, cozy and inviting space. Michael is an excellent and passionate instructor who takes great pains that all of his models and students feel like they are in an environment where they can relax, learn, grow and commune. As an artist and instructor I highly recommend the experience. Michael has created an environment where both models and artists can fully explore their creative potential. The unique setup of the modeling stand, with its many bars and ropes, allows models to take and hold poses that would not otherwise be available to them. During both instructed and open drawing sessions, the atmosphere at the studio is warm and supportive, even joyous. It is always a pleasure to work for these artists. I would recommend the Drawing Studio to any model or artist who is prepared to take risks and approach his or her craft in a new way. My name is Shawnrey and I'm a model for Michaels' drawing studio. I am also a dancer, yoga teacher and actress and love to work with kids. Michael's Studio is my absolute FAVORITE place to model! The set up is wonderful and fun. I've never had so much fun in a space, I feel I can be as creative as the artists that come to draw and paint. The atmosphere of the studio, from the artists, Michael, and snack time, is so amazingly and consistently welcoming and warm. Michael was the first one to hire me as a model in the Bay Area and I am ever so grateful! Because he has his own auditions (also a wonderful and informative event where clients get to vote on whom they also want as a model) I was able to show that I am a good model when no one else gave me a chance. I feel very supported, respected, and professional with the 23rd Street Studio. I find that I learn as much about life as I do about art in his classes. For myself, as a dancer and choreographer, and as well a visual artist who has studied in the fine arts of drawing and painting, to "model", I look primarily for an angle where the body as an object can be observed and broken open, where my being a resource can be engaged with art history, direct perception, and as an experiment in contemporary vitality. This is a craft and attentiveness that must always be tended to. In Michael Markowitz's teaching classes, the role of a model is engaged and taken apart in such a way. I as well, am a student and an artist, listening to what physical honesty, rigor, and creative awareness I may have to offer. "Make marks, not images", and from there...? find another way into the figure, the body, one of a "model" and your own; a process that must remain open-ended, questioning its patterns, intentions, and arrivals. Here, Michael's process and teaching method looks with insistence, play, passion, and interactivity. In this regard, he has crafted 23rd Street Studio into a multi-faceted resource for figure drawing, mark questioning, and engaging the creative process. Michael Markowitz's 23rd St. Studio is more than a place to draw. It is part think tank, part intellectual's cafe, part jungle gym, part therapists couch! In this way, the drawing experience becomes unexpected and vital for all involved, from model to student to artist. as a model who worked at the 23rd street studio for many years, it always felt like a privilege to be part of the dynamic environment that michael has created. his classes create a safe place to explore the passions of drawing, while continually seeking out new ways of expression. many students/artists have been coming to the studio every week for years, fostering a feeling of community, one that is grounded in a rich past while always open to including new people. the experience at 23rd street studios is, for many, an incredibly transformative experience. (does this work? being part of your studio was such a positive experience for me in so many ways, i want to make sure i get that across (and there is so much to say, it's hard to encapsulate it!). 23rd Street Studio is a space where the artist and artist model can allow the magic to happen. I've had the opportunity to witness this in my 19 years modeling for the studio. 23rd Street Studio is a creative space for artistic challenge, insight and thought. A space where the creative energy flows for the artist and the artist model. Modeling for the 24th street studios has been a great experience. creating a space for creative energy.